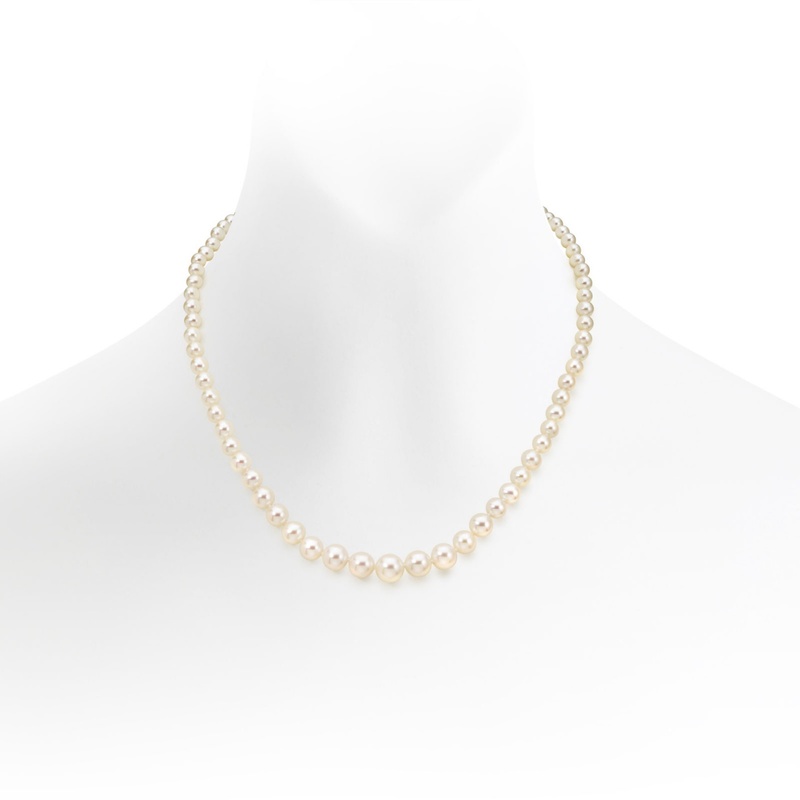 A classic style of Freshwater pearl necklace, echoing a vintage style of earlier times, with a steady graduation of pearl size and available with an 18 carat white or yellow gold clasp. The pearls in the necklace are graduated in size, measuring between 4mm in diameter at the rear of the necklace to 8.5mm in diameter at the front. These Freshwater pearls originate from China, where they are cultured in mussels in lakes and streams. They have a creamy white body colour and a sharp lustre. The necklace is strung by hand and individually knotted between each pearl to make a 45cm princess length necklace that will sit comfortably just below the collarbone. Each necklace is available with the choice of a secure fastening 18 carat white or yellow gold lobster clasp. Service rating : Very impressed with how my order was dealt with. Great packaging and my wife is delighted with her pearls. Product : Just what my wife wanted for her birthday. Reply Thank you very much for your kind review of your recent purchase. It is lovely to hear that the Classic Graduated White Freshwater Pearl Necklace was perfect for your wife and that everything was just as expected. If we can be of service again in the future, please do not hesitate to let us know. Service rating : Winterson were extremely easy to do business with. Communication was first class. My purchase arrived next day as promised. Very good packaging. I really can't find any fault with this company. Product : The necklace was exactly as described. Absolutely beautiful and good value. I have one delighted wife on her birthday. The box and wrapping are very classy, a perfect complement to this special gift. Many thanks to all at Winterson. Service rating : Excellent product presentation, beautiful quality and excellent service. I plan to use Winterson for important gift purchases every year as a result. No reservations whatsoever. Product : The favorite gift of the Christmas season in the opinion of the happy recipient: my beautiful daughter.